EU officials on Tuesday poured cold water on hopes of holding a special summit this month to seal a Brexit divorce, saying talks have made some progress -- but not enough. "Clear that more work is needed in Brexit negotiations. 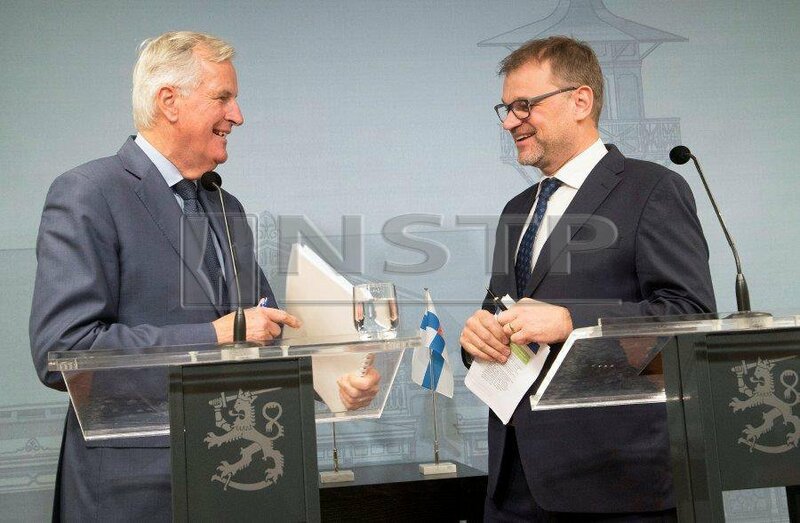 We remain determined to reach a deal," the European Union's chief negotiator Michel Barnier tweeted from Helsinki after meeting Finnish officials. One source close to the negotiations with London told AFP: "I think the summit will be in December. For the time being not enough progress on Irish border question to have a summit in November." EU President Donald Tusk held a call with British Prime Minister Theresa May on Wednesday, but there was no breakthrough and the official said "member states will need time" to digest any draft deal. The main sticking point is the border between EU member Ireland and the British-ruled province of Northern Ireland. Both sides say they want to avoid the emergence of a hard border that could undermine the 1998 Good Friday peace agreement -- but London does not want the province to remain in the EU Customs Union indefinitely. May has said no British prime minister could agree to such a concession, but negotiators are reported to be working on language for a "review mechanism" that would govern the backstop. Irish premier Leo Varadkar, visiting Helsinki for a meeting of European centre-right parties, said "every day that passes, the possibility of having a special summit in November becomes less likely." "But we do have one scheduled anyway for the 13th and 14th of December, so not getting it done in November doesn't mean we can't get it done in the first two weeks of December," he added. "But I think beyond that you're into the new year which I think wouldn't be a good thing." And on Tuesday, after meeting British officials in London, Belgium's Foreign Minister Didier Reynders warned that it might take to the end of the year before a deal is possible. Barnier has made it clear any talk on Britain's future relations with the union must wait until the withdrawal deal is enshrined in a legal treaty. And Tusk has said he would not call the summit that would approve such a treaty until Barnier had been able to report to him that "decisive progress" had been made towards agreement. On Monday, however, Barnier will brief ministers from the other 27 EU member states on the situation in the talks -- even as their capitals ramp up planning for how to deal with a "no deal" Brexit. May, meanwhile, has to make sure any deal wins the approval of her party and parliament. And EU negotiators say they fear that none of the options on the table could command a Commons majority. "Negotiations with the UK are a bit like the Echternach Spring Procession: three steps forward, two back," he told visiting German politicians, according to Der Spiegel reporter Peter Mueller. Emergency summit to seal Brexit deal?